Ibo et Non Redibo: "I am Pregnant with Expectation"
"I am Pregnant with Expectation"
I have used this expression of pregnancy for several years to indicate my excitement about an upcoming event. It denotes my anticipation for the celebration of a holiday like Christmas, a birthday, or the release of a long-awaited music album or film. Recently, I remember using it when telling friends apropos my giddiness about Mumford & Sons' new album or my trip to the Basilica of our Lady of Guadalupe. Just last week, I used it to announce my childlike anticipation for a decadent piece of chocolate cake (it was my way of making up for Mondays). In moments of reflection or introspection, the phrase has acquired a distinct meaning for me. It reminds me that I am always filled with expectations about myself. The expression reveals my awareness about the many conjectures that I have about my own life. These expectations are more than predictions or projections of what I would like to do with my life: “In a few years, I should be the Jesuit chaplain at the MI6” or “In 2022, I will be the first Jesuit in space.” They go beyond the normal resolutions that I make once in a while in my journey towards well-being and growth. They have very little to do with my natural concept of success, conversion or transformation. My expectations are mostly inspired and motivated by what I call the inner voice of perfectionism. These self-expectations express an image of what I want my life to look or to be like. They convey the way I measure myself against the image of all that I “should” be. As a Jesuit seminarian, many of those expectations arise out of the qualities and polarities that deeply mark the life of a son of Loyola: being and doing; contemplation and action; prayer and prophetic living; being completely united with Christ and completely inserted into the world with him as an apostolic body (Jesuit General Congregation 35, Decree 2, n. 9). Sometimes I joke with friends that a Jesuit should be a monk at dawn, a scholar in the morning, a community organizer in the afternoon, a chaplain in the evening and a superhero at night. And while I say this as a jest, there is some truth to my joke. Often, while I examine the many expectations I have for myself, I get a clearer picture of what I want my life to be like. I want to spend two hours on daily prayer, go to mass daily, pray a Rosary, read at least two newspapers and a magazine or journal, work at least nine hours, exercise for an hour, make some time for spiritual reading, while leaving some time for a good novel, spend quality time with friends, companions and the members of my community, reply to every email, Facebook message and Tweet I receive and leave enough time for recreation, self-examination and rest. By now I think I made the picture quite clear. As clear as high definition. I can never accomplish all these things in a day. There aren't enough hours in a day for this. Even if the day had more hours, I am sure I could add a few other things to that list. Thus, in order to cope with the demands of life, ministry and my own expectations, I need discernment. This implies much more than just being savvy at making decisions. Certainly, there is a need to learn to prioritize, to manage my time and to remain on task; more importantly, there is an even greater need to being attentive to the movements of my heart and my soul. I see these expectations as images that I have about myself, as standards of doing or being. They are usually more about doing than about being. Some of these expectations do not come from God; they have nothing to do with my desire to grow in faith, hope and love. Therefore, I need a discerning heart to pay attention to these images and standards and to learn where they come from. At times, I need to get rid of some. There is a Muisca story about an Iraca, an aboriginal priest, who was burdened with many expectations that he had of himself. One day he realized that many of those expectations were harming him and those around him. He left the village and sat by a river to visualize what his expectations looked like. He imagined them as a large set of wooden panels that surrounded him. On each panel there would be an image of what he thought he should be like. He recognized that these expectations encircled him so tightly that he had no room to escape, and the light of the gods (Sue –the sun – and Chia – the moon) could not reach him. Without their light, he could not be true to himself; he could not be a good Iraca. I think the same is true for me. I can easily become burdened with self-expectations and forget that I need not fix my attention on them, but rather fix my eyes on the Crucified and Risen Lord. It is in him that I find the true image of what it means to be a human being. To be true to myself is not about realizing all my expectations. Rather, it is being real: contemplating the One who is the Lord of reality and truth. 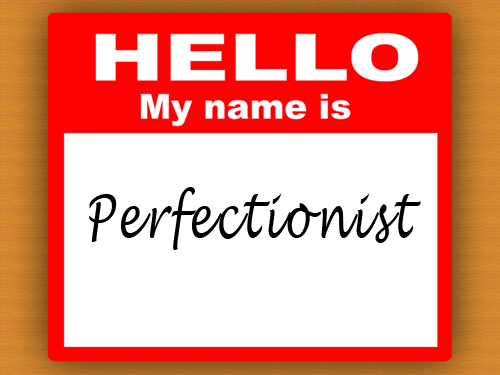 In contemplating Jesus, I discover that the inner voice of perfectionism is a regular mechanism used by the enemy of our human nature, the devil, to divide and conquer. Jesus, the human image of God and the divine image of humankind, is the one whom I am called to contemplate. In our journey as disciples of Christ, there is an urgency to forgo our concern with the expectations that weigh heavy on our shoulders. We are called to enter into dialogue, not with the inner voice of perfectionism, but with the inner voice of Love: God who dwells in our hearts. He is the one we are called to imitate. In our contemplation and imitation of Jesus, we tame the expectations we have of ourselves. I imagine my expectations as a lion that needs to be subdued. The taming occurs not by using a whip, but by lovingly being drawn into the heart of Jesus and letting go of my obsession with unrealistic expectations. By being drawn into that furnace of love, I am emptied of my expectations; I am liberated. In the intimacy with Living Lord, I learn to be myself. Every moment of communion with Jesus, the image of the invisible God, fashions me into the person God calls me to be. In those encounters, Jesus exhorts me to "follow him". And that has me "pregnant with expectation". Santi: Once again you freaking nailed it. I was thinking about something very similar. Thank you. I would like you to say more about how we find out what expectations come from God and what expectations do not. I am lost with that.